Over the past two decades, there has been much discussion around Dolly in the scientific community. 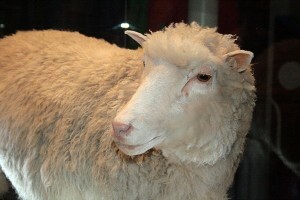 No, not Dolly Parton (although her name served as an inspiration), but Dolly the cloned sheep. In 1996, researchers at the Roslin Institute, an animal sciences research center at the University of Edinburgh, made history by cloning the first mammal from an adult somatic cell via nuclear transfer. The cell utilized for the cloning was from a mammary gland, and Dolly’s successful birth and 6 year longevity signified that cells other than gametes and germ cells could recreate an organism. However, scientists and laymen alike have expressed concern regarding Dolly’s short lifespan in respective to the overage sheep’s of 10-12 years. Does this mean clones are unhealthier versions of their “natural” predecessors? According to research conducted by Kevin Sinclair of the University of Nottingham, the answer is no. Monitoring four sheep derived from the same mammary gland cells as Dolly in addition to nine cloned sheep of other breeds, Sinclair has dug up no evidence to suggest that the clones are less healthy than sheep born of natural processes. In fact, all 13 of the sheep are now older than nine (equivalent to 70 or 80 years in the lifespan of a human) and are as healthy as their non-cloned counterparts according to tests scanning their bones, blood glucose levels, and blood pressure. And so the question is posed, why did Dolly die young? Scientists who interacted with Dolly claim that her life was taken by a contagious illness that ravaged the flock- not some defect as a result of her being a clone. To address Dolly’s severe amounts of arthritis at the time of her death, geneticist Helen Sang from the Roslin Institute points to her indoor captivity and the excessive amounts of treats she was given. While cloning might not be as efficient as traditional modes of breeding, this study exhibits that cloned animals which survive gestation and are relatively healthy during their infancy have the same chances of thriving and living to expected longevity as any other animal of the breed. Additionally, cloning allows scientists to generate embryonic stem cells for further scientific research and to produce “high-value livestock”. These advantages begin to show the importance of clowning and how beneficial it can become if it is accepted as an integral part of scientific studies. What animals are next to be cloned? What impacts would cloning humans have on our society? How Did Our Baby Learn That Word?!? !